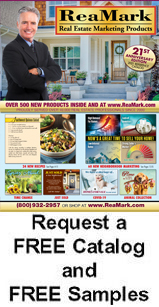 Since September 2000, ReaMark has helped over 40,000 Real Estate and Mortgage Professionals with their marketing needs. We specialize in designing real estate postcards, real estate newsletters, real estate calendars, door hangers, sport schedules, business cards, notepads and much more. With over 2,500 different designs, an in-house graphics department and live customer service sales professionals we can help you increase your leads listings and sales within your marketing budget. Since we talk with real estate professionals on a daily basis, we know what works. Call us today at (800) 932-2957 for a free sample and catalog package. In addition, our mailing services provide Real Estate agents with a "stress-free" marketing program. All you have to do is order your cards and provide us with your mailing list. We'll take care of all your printing and mailing so you'll have time to concentrate on other important things. The ReaMark Difference is... You! Order the designs YOU like, with the messages YOU want, and in the quantities YOU need. NO YEAR LONG PROGRAMS REQUIRED. YOU can order as few as 300 cards fully customized with your photo, company logo, association logos, business information and message. Order one of our recommended programs, or mix and match any card with any message... or create your own message absolutely FREE. Save up to 60% over other postcard companies. Most orders are printed and shipped within 3-5 business days on receipt of layout approval. Please allow an additional 1-5 business days for UPS delivery. We absolutely, positively guarantee your complete satisfaction! NO QUESTIONS ASKED!!!!! If you are not happy with the quality of your order, we will replace the order at no additional charge.